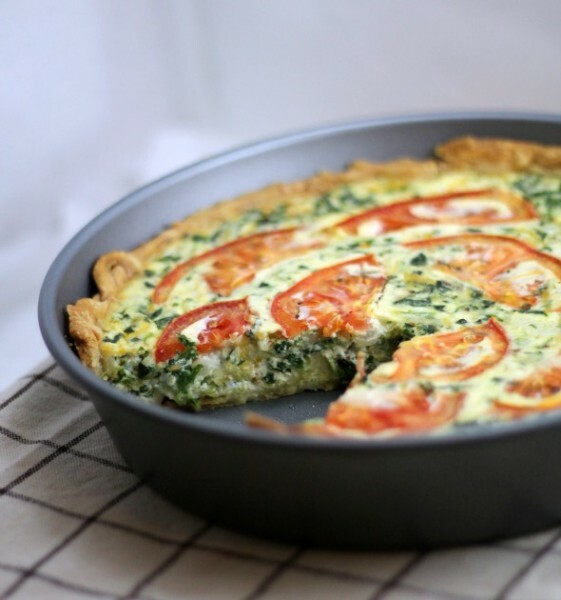 This savory Tomato Bacon Spinach Quiche is perfect for breakfast, lunch or dinner. Make it the night before, have an quick breakfast in the morning! Something that I enjoy greatly but don’t bake often enough is quiche. Quiche is a pretty versatile meal. You can make it with just about any meat or veggie and it’s great for breakfast, lunch or dinner. The typical quiche that I prepare consists of ham, onion and swiss cheese. Last night I decided to go outside the box and make a different type of quiche. I had leftover pie crust dough from a recipe I made last week (not a homemade pie dough, this one was store bought) as well as some bacon and frozen spinach. I decided to make a Tomato Bacon Spinach Quiche to give us dinner and perhaps breakfast for a couple of days. All I had to get was a tomato and some more shredded cheese (which happened to be BOGO free at my grocery store this week!) This quiche turned out pretty good. I will definitely make it again. The addition of the tomatoes really paired well with the spinach and bacon. I hope you enjoy this recipe. Place the pie crust in a 9" round cake pan. Freeze for 15 minutes. Bake the pie crust at 350 for 15 minutes. In a mixing bowl, combine the beaten eggs, cheeses, milk, half and half, bacon, spinach, onion, pepper and seasoned salt. Pour the mixture into the prepared pie crust and even out if needed. Top with the sliced tomatoes. Bake at 350 for 45 minutes or until a toothpick inserted into the center comes out clean. Cool on a wire rack for at least 15 minutes before serving. found you via pin junkie- pinned! Looks pretty! I love any quiche, especially with bacon. I always convince myself that the health benefit of the spinach balances out the bacon. Ha! I often clean out my refrigerator by making quiche. Yours came out beautiful. The tomatoes are a nice touch. LOVE the idea of putting the crust into a cake pan. Shallow pie pans for quiche have always made me nervous. Quiche of any kind is a favorite dinner at our house, and the hubby will like this one because it has spinach in it. Looks amazing and you make it look so perfect and easy! Thanks so much for linking to Make the Scene Monday @ Alderberry Hill. You are being featured this evening! I hope you are having a wonderful weekend, and join me tomorrow night for Make the Scene Monday #62! This looks AMAZING! That first photo is especially gorgeous. I love bacon, spinach, and tomato in my omelette, so I’m sure I would love this. Pinning to try very soon! I do love quiche, this looks delicious. I like to serve quiche with fresh pico. Yummy. Visiting via Call Me PMc – Pinned this for a brunch. I AM GOING TO MAKE THIS ON WED FOR A BIRTDAY BRUNCH! Awesome! I hope you enjoy it! So glad I found you through ZipList, (recipe finder & organizer). Can’t wait to make your quiche recipe for dinner. More than likely will add sauteed cremini mushrooms into the ingredients list. Pingback: Quiche! | Stella Singleton // food.art.love. Yummy yummy! :) Loved this recipe and will be making it again! Hi Jennifer! So happy you enjoyed the recipe. Thank you SO much for stopping by to let me know! I have made a lot of quiche recipes but this one has been the best so far. Very fluffy and excellent taste. Would this work with fresh spinach that has been wilted? Can this recipe be frozen? Or any ways you would recommend to prep parts ahead of time? Thanks! 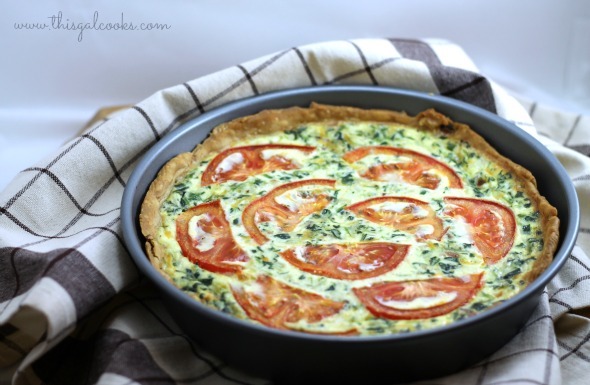 This quiche is AH-mazing! I made it for work and everyone loved it! I doubled the bacon since we have quite a few meat lovers and it was great. It also looks super pretty with the tomatoes on top! Hi Julie! I was hoping you could possibly help me out with a few questions I have. I am working on an informative speech and picked this delicious quiche recipe to demonstrate. But I need to cite it in order to give you credit. It needs to be in APA Format. So, I need your last name if you can provide it for me and the year in which you created/ posted this recipe. Thank you!!! I’m a vegetarian so I made the quiche with vege bacon, almond milk, a soy creamer, and vegan cheese. It’s wonderful!. I made this with a spaghetti squash crust — delicious! This is delicious! My grown daughter requests it every year for her birthday brunch. Thank you for sharing it on pinterest. Made this last week for our Thursday night dinner. I only used the whole milk and not the half and half. Added 3 extra eggs from our hens….and used Monterey Jack cheese for both cheeses. Less fat calories from the cheese that way. And fresh homegrown tomatoes. My husband loved it. I served it with a fresh green salad.